Thanks to you and your endless support we could reach our goals and grow even more in 2018. From the new features of the tellows app to our new and fresh homepage design, we will tell you all the important news in the following annual review. Check it out! Kenneth (01315614532): I received a call from this number this morning which I listened to the whole of the outgoing message and then the caller hung up. Having a Panasonic phone I called it Pest and barred it. 6 hours later they phoned again to pay to listen to the engaged tone and without disturbing me further. I have read most of the submissions made to this site and I am grateful for your research and contributions. I believe that until we make them pay for every call they make and give them no answer they will not stop. I set the number of rings to two and this allows my phone with talking caller id to tell me all I need to know without me doing anything. My caller list of the last 50 numbers called used only cover the previous 12 days until I did this. I it now covers more than 40 days and it is increasing. Concerned (01709918621): Had six missed calls over 3 days,so called number back. Recipient didn’t state who they were upon answering – silence! When I said hello they asked is that ? and they had my name. Purported to be from Vodafone but is bogus call confirmed by Vodafone. My number is recorded for no marketing calls. Advising the Police and Information Commissioners Office. Would urge others to do the same in the event there are sinister implication. As we can see above, most of the calls are reported as telemarketer, aggressive advertising, or even trustworthy numbers. This shows that our users receive various calls and not just dangerous or unwanted spam calls. 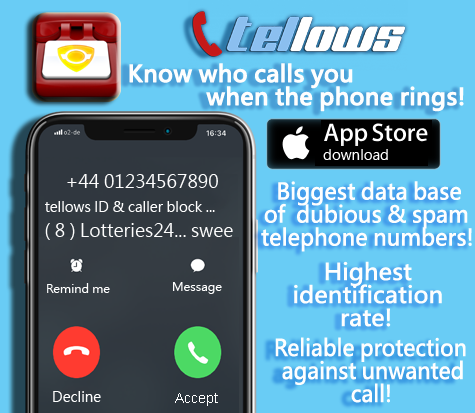 Thanks to the reports from all tellows users, we can find out which numbers are trustworthy and which numbers have potential danger of scam. We are very happy that we could bring you substantial updates of our app in 2018. 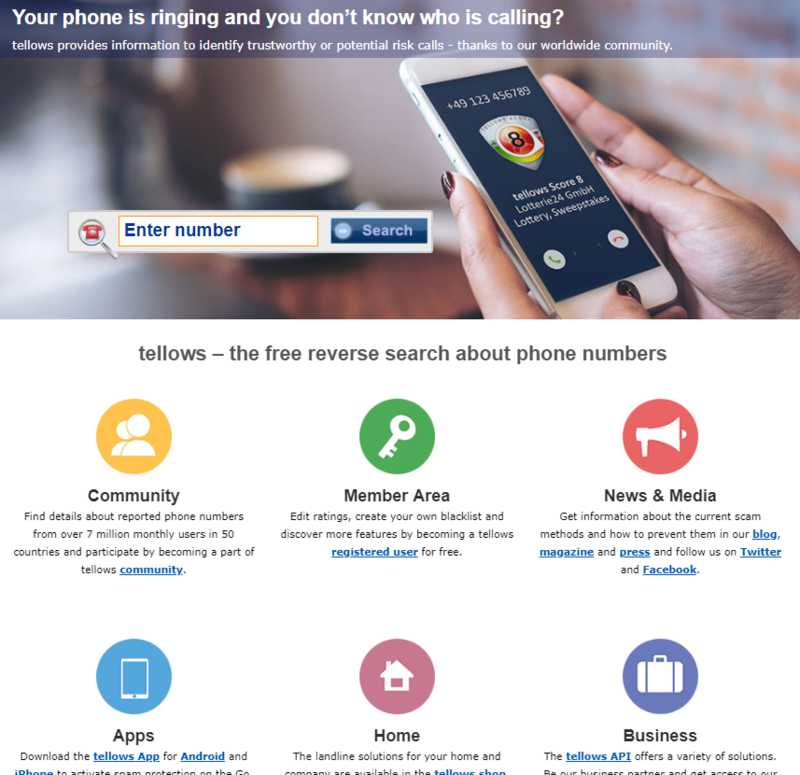 Our tellows iPhone “Caller ID & Block” app can now offer you even more features than before! 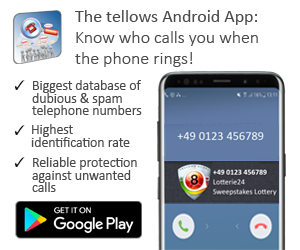 As a registered user of tellows you can, for example, use the premium version of our android app for one month free of charge! On top of that, you can have the access to the cross-devices blacklist by simply logging into your tellows account in your device. Further information can be found in this blog article. Furthermore, you can create your personal blacklist and add the telephone numbers you’d like to block. Every time you rate a phone number negatively, the number will automatically be added to your personal blacklist and will be blocked from calling you. You can find more information regarding blacklist here. In the late Autumn of 2018, we developed a new rating feature in our online platform. Thanks to the simple rating box, you can easily rate a number without leaving any comments. We also created the rating slider to make it even easier for you to choose the right score. Caller types and caller names are no longer obligatory and you don’t have to fill this in when you don’t have enough information regarding the caller. Have you checked out our new homepage design? Now you can see an overview of all tellows projects and branches, e.g. the tellows apps, landline solutions, our social media channels, etc. If you scroll down, you will see the tellows world map that provides the total current number of our users, ratings, and API-requests. Thus, you can always observe the ongoing growth of tellows. As you know from our last blog article, the 2nd edition of our magazine is now available for you! In our magazine, you can find different scam methods and of course, our tips and tricks to protect yourself from these types of scam. In addition, you can also see the latest news of scam victims and the current number in statistics. Keep yourself uptodate and download our free magazine here! We would like to thank you for your support in 2018 and we look forward to protect you further from unwanted and dangerous calls in 2019!